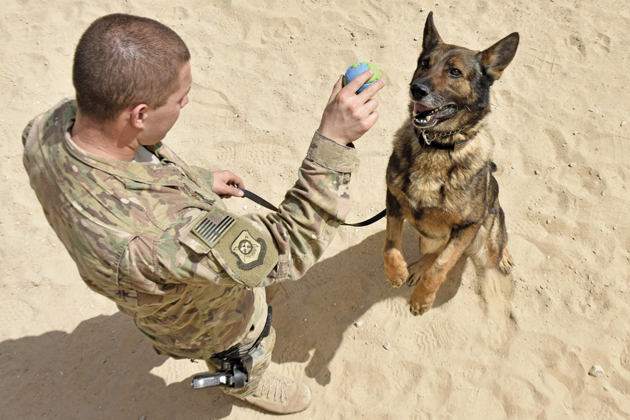 Senior Airman Carlton Isaacson, 407th Expeditionary Security Forces Squadron military working dog handler, plays with Egon, 407th ESFS MWD, after an obstacle course training session at the 407th Air Expeditionary Group in Southwest Asia. Isaacson and Egon have been partners for approximately a year and a half. SOUTHWEST ASIA — Dogs are believed by many to be man’s best friend. They have been companions to humans for hundreds of years. 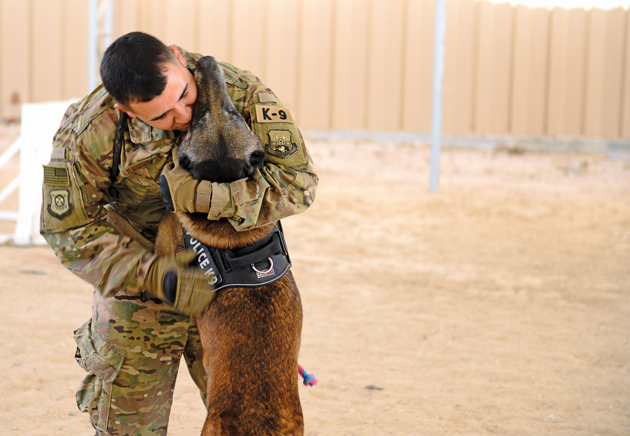 Military working dogs are among the unsung heroes of the military and play an important role from therapy dogs supporting service members and veterans suffering from post-traumatic stress disorder to military working dogs supporting operations on and off the battlefield. 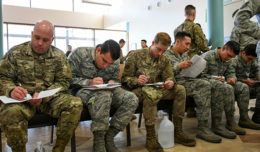 In the Air Force, their natural skills directly augment members serving in security forces squadrons around the world. One of the most crucial MWD missions in a deployed environment is explosives detection. Despite modern advances of metal detectors and blast-protected vehicles, dogs are the irreplaceable first line of defense with their expert sense of smell, while their mere presence brings a psychological deterrent to the enemy. The real story of the contributions these four-legged Airmen make, however, is invisible. A powerful bond between canine and handler grows stronger with every interaction in order to provide safety and security for thousands of lives day in and day out. 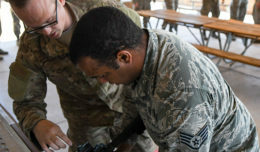 Senior Airmen Carlton Isaacson and Omar Araujo are military working dog handlers assigned to the 407th Expeditionary Security Forces Squadron, deployed to Southwest Asia in support of Operation Inherent Resolve. For the past two years, Isaacson has partnered with 8-year-old German shepherd Egon, while Araujo has been joined by German shepherd, Syrius, for more than a year. 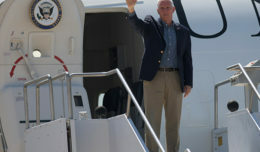 In the unusual human and animal duos, attention to detail, care, trust, and communication are the keys to mission success, Isaacson said. The bond between dog and handler isn’t always immediate, however. Repetition and effort close the gap between the partners, but it’s the long hours and determination that solidifies the emotional bond that is built. Dogs get extremely attached to their handlers so when a new handler is assigned to them, they both have to adjust old tendencies and habits from previous partners. 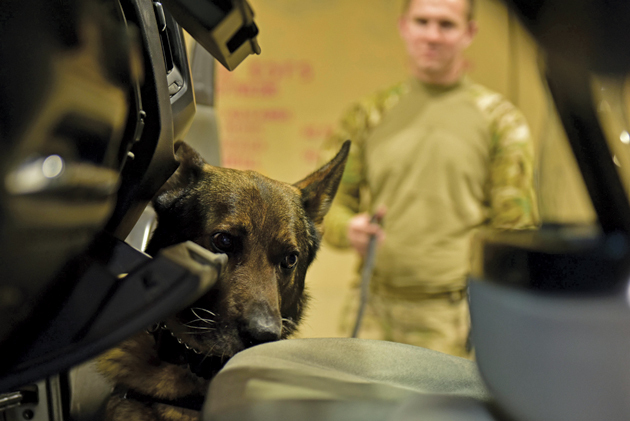 Locking in that trust is a huge part of what MWD handlers have to work toward when first introduced to their dog. Hours, days, weeks and months are spent trying to become a close-knit team. Once built, the bond is difficult to break. When Araujo first met Syrius, Syrius was with his old handler and the connection between the two made for a slow transition between handlers. Handlers have to find ways to build relationships and trust with the dogs when they are partnered with them. It’s an ongoing task to maintain the bond between the two. “What I enjoyed most were those quiet moments when all the training was done for the day, and after a long walk I could just sit in Syrius’s kennel for hours while he relaxed and napped,” Araujo said. “I would listen to music, read books or even watch movies until he knew I was the last person he saw at night and the first every morning. Communication is important in any relationship but it’s lifesaving in combat zones. Not being able to communicate verbally with their partners, dog handlers have to become cognizant of every move and reaction their canines make to effectively work as a cohesive unit. Learning each other’s temperament and personality plays a huge role in the relationship between dog and handler. MWD handlers also go through an extensive weeklong class on veterinary care for real-world incidents to help care for and minimize damage to their dog. They schedule and take their canines to veterinary check-ups and administer medicine when needed. Not only do they take care of an Air Force asset, but also their four-legged wingman. Egon, a 407th ESFS military working dog, searches a vehicle at the 407th Air Expeditionary Group in Southwest Asia. Egon’s handler is Senior Airman Carlton Isaacson. Syrius, a 407th ESFS military working dog, jumps up and hugs his handler Senior Airman Omar Araujo May 23 in Southwest Asia. Araujo and Syrius have been working together for close to a year and are deployed in support of Operation Inherent Resolve.